Oyster Bay Chardonnay, a light wine with delicate fruit flavors, is better suited for warmer weather drinking than the familiar full-bodied, oaky and buttery Chardonnays from other parts of the world. The dry, fresh characteristics of this New Zealand wine are heavily influenced by the vineyards where the grapes are grown. There the rocky soils, cool ocean breezes, warm days and cold nights allow the small berries to ripen slowly and develop intense citrus and melon flavors and aromas of white peaches, the tasting notes say. After harvest, chief winemaker Michael Ivicevich uses a combination of special French oak barrels that impart a slight flavor and stainless steel tanks for fermentation, a process that retains the quality of the fruit. He also does not apply malolactic fermentation, an inoculation that gives other Chardonnays a rich buttery flavor that’s lovely to sip on while sitting by the fire on a cold night or enjoying with a warm bowl of soup. Ivicevich is a fourth-generation New Zealand winemaker. His grandfather Mick learned the art in his native Croatia before escaping Europe’s post-World War I economic and political collapse and emigrating to the Antipodes. Michael Ivicevich’s father and mother own and operate the award-winning West Brook Winery, about 30 miles north of Auckland, the largest city and chief seaport on the country’s North Island. Instead of working for the family business, Michael, 43, chose at a young age to go to work for Delegat’s Wine Estates, New Zealand’s largest family-controlled winery and the producer of Oyster Bay. He studied winemaking at Australia’s Charles Sturt University. Michael also helps his parents with their business, offering assistance with duties ranging from blending to choosing a winery site, according to an article in the New Zealand Herald. Although Oyster Bay Sauvignon Blanc is highly praised and globally known, the Delegats, who also trace their roots to Croatia, are not. They are a quiet family who make few public statements about their business, except in annual reports to minority stockholders, a 2016 article in Forbes magazine says. The company is run by Jim Delegat and his sister Rose. The siblings and long-term advisor and board member Robert Wilton are listed as controlling 66 percent of the stock. Wilton has been assisting the family since the company almost went bankrupt during the 1980s when New Zealand produced a glut of wine. In 2017, Delegat reported selling 2.66 million cases and having a market cap of almost $400 million, the annual report says. The Delegat family history is ill-defined, but the Forbes article says it goes back to 1947 when Rose and Jim’s parents, Vidosave and Nikola, founded a vineyard shortly after emigrating along with some fellow Croatians who settled near Auckland and started the modern age of Kiwi winemaking. The Croatian winemakers, including the godfather of New Zealand wine, Nikola Nobilo, are credited with turning the country’s wine industry around in the late 1980s by moving away from sweet, largely unpopular wines and planting Sauvignon Blanc grapes in the glacial soils of the Marlborough region, on the northwestern tip of the South Island. Those highly lauded wines turned the country from an insignificant producer to a major player. The first vintage of Oyster Bay Sauvignon Blanc, in 1991, garnered international attention and was awarded “best in the world” for the varietal, the company’s website says. Although I’m a big fan of Oyster Bay Sauvignon Blanc, I really like the Chardonnay for its complexity of clean, uncluttered flavors. This Chardonnay is an excellent wine to have with summer entree salads or grilled fish and chicken. The philosophy of the Delegat family and Ivicevich is to produce reasonably priced, fine, distinctively regional wines that are elegant and assertive with glorious fruit flavors — wines that drink well within a year or two of the vintage, yet possess the balance of structure of long cellaring, the website says, noting that Oyster Bay does not produce reserved wines. 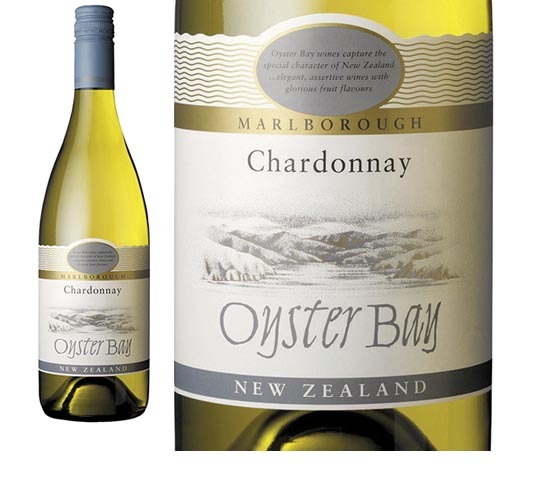 Oyster Bay Chardonnay is an excellent example of a wine that reflects that philosophy. The wine is widely available. Although it has a suggested retail price of $15, I find it regularly on sale in the $10 range and as low as $8.95. Even at the full price, it’s a bargain and during these hot months, it’s a treat.